Happy Gobble Gobble day well it's actually friday at least here but ya know!!! And i'm also giving a special thanks to Candied Codes cuz i used a css from them on this page and also their site helped me figure out how 2 do it on my own so thanx!!!! Okay well i'm up and going and still working i just added a rate thing and i'll rate your site and in like an hour i'll also have a layout request where i'll make you a layout!!! But please be patient i love you all and happy holidays!!! Hey guys new layout ain't it groovy it took a long time to peace together!! 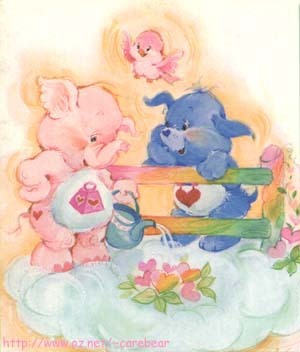 I've been having obsessions with the carebears lately so i used them for this layout not to metion that this is the time of year where we need to be caring for others and not just ourselves because you never know when that person will leave you forever!!! okay that's my testimony for the day i'm sorry i've been so bad with the site and stuff but i figure not to many people come to it any way so i get that privelage at the moment!!!! Well i love you all may God Bless everyone during the holiday!! !